Here are profiles for most of the main tribes on The Tribe. The Mallrats are the main tribe on the show. They have had many leaders at different times such as Amber (s1/s3), Bray (s1/s2/s3), Lex (s1), Danni (s2), and Ebony (s2). 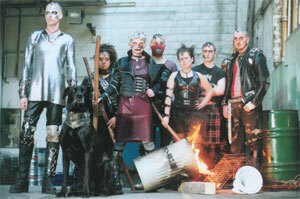 Tribes such as Tribe Circus (s1), The Locos (s1), The Chosen (s2/s3), and The Mosquitos (s3) have been their rivals. The Mallrats have always wanted peace in the city and did the best they could to help build a new world. They always consider people before profit like when they gave out the antidote to anyone that needed it instead of charging. They care about each other and will do almost anything to protect the other members of the tribe. The make-up for the Mallrats changes frequently and everyone is different. Each of the Mallrats style is different as the person's style represents what the person thinks, feels, and believes. The leader of the Chosen is The Guardian. The Chosen want everyone to bow down to their god, Zoot. They will go to any lengths to make this happen. If you don't bend to their will they will usually make you suffer greatly. Most members have 3 white dots in a vertical line on forehead. Some members have blue hair and lots of the girls wear braids in their hair. Each section of the Chosen have a different style. The section depends on whether the member is new to the chosen, a praetorian guard, a normal member or in leadership. 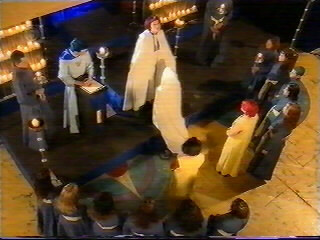 Yellow coats are worn by new members to the Chosen, where all other worshipers where blue robes with hoods. The Praettorian Guards wear blue helmets and football pads. The Guardian wore a white robe with a hood but it soon changed to a white leather outfit, the other role in leadershipLietenaint Luke wore a very light blue robe similar to The Guardian's first robe. We don't know who the leader of the Demon Dogz is. They were one of the main tribes in the city until The Chosen took over. They are willing to fight anyone who gets in their way which means their name strikes terror into any outcasts. Demon Dogz use silver, and this has become their trademark. They all share the same stlye. They all wear silver and black. This type of style lets anyone know who they they are dealing with. The style is meant to be over powering and intimidating, which sometimes works. Moz is the leader of the Mosquitoes. Their main rival tribe is the Mallrats. The Mozzies are an all woman tribe. They are strong and know what they want and how to get it, but get annoyed and angry when demands aren't met or they are accused for something they haven't done. The main make-up design used is pink around the eyes. The Mozzies seem to dress all in black, apart from the head gear which is worn. The head gear is silver and is meant to resemble mosquitoe eyes. The Locos have been lead by Ebony and Zoot. The Demon Dogz are their biggest rival. At one time the Locos were one of the strongest tribes in the city. After Zoot died, the tribe was taken over by Ebony. Near the end of s1 the Locos disbaned when a rebellion against leader Ebony occured. The Loco make-up usually contains some red such as lines and designs in the color. The Locos seemed to dress to put fear into others eyes. They dress in no particular code but use red and black. 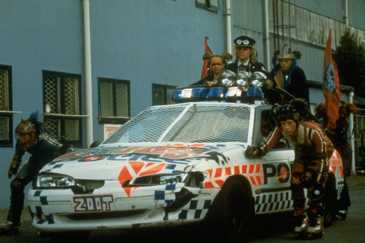 Also they wear helmets and seem to use a lot of leather. The overall style gives the impression of their infamous saying, 'Power and Chaos'. The leader of Tribe Circus is Top Hat. Tribe Circus rivals anyone who ticks them off or offends Top Hat. Tribe Circus seems a fun entertaining tribe from the outside, but inside they are a group of frightening mad men who will fight at a moments notice. There is no paricular make-up design apart from the theme 'Circus'. Different members dress like clowns and other entertainers associated with a circus. The leaders of the Nomads are Troy and Susannah. No rival tribe is known, but ya better watch out if you meet them alone. The Nomads seem a peaceful helping tribe on the surface until the are pushed to make decisions. They can sometime seem unfair and evil as they make their living by slave trading. This kept them safe from tribes like the Locos. Nomads seem to wear the compass north sign on the cheek. The tribe wears anything they can find but most of it seems earthy like greens and browns. If you have a tribe you would like me to add, email me at trudy15@tribeworld.com.